Tuguegarao—Cagayan Gov. 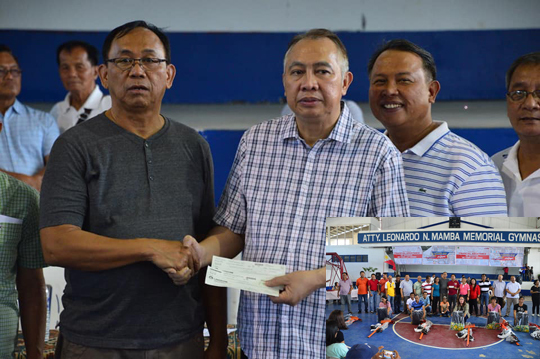 Manuel N. Mamba recently spearheaded the distribution of financial assistance under the “No Town, No Barangay Left Behind Program 2018 Fund” in Ballesteros town. Mamba vowed there will be no municipality or barangay left behind in Cagayan in terms of development and progress. “This program will ensure that every corner of Cagayan gets a fair share of assistance from the Provincial Government to propel its own advancement and growth,” he said. The organization of puroks (district or zone) in the different barangays is also part of this program. “The goal is self-reliance of the communities and the active participation of the people in decision-making of the local government,” Mamba added. As part of the Recovery and Rehabilitation Program of the provincial government to the victims of Super Typhoon “Ompong” every barangay was given garden tools—two pikes, two rakes, two spading forks, 14 hand shovel, and vegetable seeds. Each of the 19 barangays in Ballesteros received P500,000 while the Barangay Nutrition Service, Barangay Health Workers, Day Care Workers and Barangay Tanod received their honoraria. Earlier, 20 barangays in Abulug town, 30 barangays in Lasam town, and other municipalities received the same share under the NBLP 2018 fund. Mamba said he made sure that all the 29 towns, 820 Barangays and 5,740 puroks of the province will receive P5 million through the 2018 NTLB fund, including the P500,000 to each barangay and the garden tools. The governor’s Cagayan Development Agenda 2025 (Caganda) also includes programs on Spiritual and Moral Recovery, People’s Day, Task Force Lingkod Cagayan, Anti-Illegal Drugs and Anti-Illegal Gambling Campaign, Strengthened Health Service, Infrastructure Development, Tourism Development, Disaster Preparedness, Bantay Quarry and “Isumbong Mo Kay Gov” complaints desk. It aims to propel Cagayan’s economic progress through sustainable development.